Mount Pleasant is the county seat and largest city of Titus County, in the U.S. state of Texas. As of the 2010 census, Mount Pleasant's population was 15,564; it is situated in Northeast Texas. Mount Pleasant was founded May 11, 1848, to serve as county seat for Titus County, which was created by a legislative act on May 11, 1846. Until after the Civil War, Titus County also included the territory of present-day Franklin and Morris Counties. High waters along the creeks and the Sulphur River often halted travel in the early years. In the 21st century, Titus County comprises the Mount Pleasant Micropolitan Statistical Area, named for the county seat. Mount Pleasant is located at 33°9′28″N 94°58′12″W﻿ / ﻿33.15778°N 94.97000°W﻿ / 33.15778; -94.97000 (33.157891, −94.970084). According to the United States Census Bureau, the city has a total area of 12.7 square miles (33.0 km²), of which, 12.5 square miles (32.5 km²) of it is land and 0.2 square miles (0.5 km2) is covered by water. Mount Pleasant gets its name from the Mount Pleasant peak the shortest mountain in Texas. Mount Pleasant is considered to have a humid subtropical climate. As of the census of 2000, 13,935 people, 4,558 households, and 3,208 families resided in the city. The population density was 1,112.0 people per square mile (429.4/km²). The racial makeup of the city was 56.70% White, 16.00% African American, 0.55% Native American, 0.84% Asian, 0.01% Pacific Islander, 23.57% from other races, and 2.33% from two or more races. Hispanics or Latinos of any race were 40.65% of the population. In the city, the population was distributed as 31.2% under the age of 18, 10.9% from 18 to 24, 28.1% from 25 to 44, 16.2% from 45 to 64, and 13.6% who were 65 years of age or older. The median age was 20 years. For every 100 females, there were 94.8 males. For every 100 females age 18 and over, there were 89.6 males. The median income for a household in the city was $28,805, and for a family was $32,331. Males had a median income of $22,629 versus $17,080 for females. The per capita income for the city was $14,190. About 20.3% of families and 22.8% of the population were below the poverty line, including 30.7% of those under age 18 and 16.1% of those age 65 or over. Mount Pleasant, Texas has grown since the 2000 Census; as of 2010, Mount Pleasant had a population of 15,564. Titus County Courthouse – located at the Downtown Square, the courthouse is an important historical building. The courthouse has burned down three times since 1850. The current building was constructed in 1895; it suffered damage in a 1960s fire, in which all county records were destroyed. Downtown Square is bordered by several locally owned businesses. Mount Pleasant is the site of Wal-Mart's first store in Texas. Radar (2006–08), the world's tallest living horse, lived in Mount Pleasant. (In 2005, Goliath was recorded as the world's tallest living horse by Guinness Book of World Records). Mount Pleasant is a nationally recognized Texas Main Street City under the program of the National Trust for Historic Preservation. One of the largest Dr. Pepper murals in the United States is located on the side of a building that once housed a Dr. Pepper bottler. The City of Mount Pleasant is served by the Mount Pleasant Independent School District, as well as Chapel Hill Independent School District and Harts Bluff Independent School District. Northeast Texas Community College is also located in Titus County. Mount Pleasant High School is a 5A school. The mascot is the Tigers. Chapel Hill High School is a 2A school. The mascot is the Red Devils. The Mount Pleasant Tribune is a twice a weeknewspaper which was founded in 1941. A major project underway to build a 271 loop bypass around Mount Pleasant was completed in 2015. The City of Mount Pleasant is served by Titus Regional Medical Center. The United States Postal Service operates the Mount Pleasant Post Office. 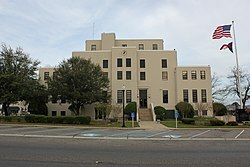 The Texas Department of Criminal Justice (TDCJ) operates the Mount Pleasant District Parole Office in Mount Pleasant. Barry Minter, former National Football League linebacker for the Chicago Bears and Cleveland Browns, appeared in 16 games for Cleveland in 2001 before retiring to Mount Pleasant. ^ "Post Office Location – MOUNT PLEASANT Archived 2012-06-09 at the Wayback Machine." United States Postal Service. Retrieved on May 15, 2010. Wikivoyage has a travel guide for Mount Pleasant (Texas). This page was last edited on 26 January 2019, at 07:02 (UTC).